YouTube is undoubtedly one of the best places to enjoy video and music, thereby it’s a repository for human joy. Music fans regularly visit YouTube for most famous music videos that can always be found and saved from it for offline listening. — they often allow you to rip the audio from multiple YouTube videos at once. In this article, we will cover top 5 YouTube to MP3 converters and give you a quick rundown of the really workable and clean tools that you can use for free. Free YouTube to MP3 Converter is a wonderfully easy way to rip the audio from YouTube videos and save it to your PC in MP3 format. It works well on both Windows and Mac platforms. You’ll only need a couple of clicks to get started with this converter. In addition, the program has several handy options such as to skip downloading if the file already exists, save video thumbnails, add output audio files to a new iTunes playlist, have your computer shut down once a download is complete, paste URLs from the clipboard automatically, download via a proxy, etc. But it’s important to note, that the free version does not include the option to download an entire YouTube playlist or channel. If you are looking for the ability for bulk downloads, you need to upgrade to the paid Premium version of Free YouTube to MP3 Converter, which costs 69$ per user per year or 99$ per user for an unlimited period of time. Freemake YouTube to MP3 Boom as being the most stylish all-in-one YouTube music software, allows you to search YouTube tracks, convert them to MP3, share your favorite tracks via Facebook or Twitter and listen to all your music in one place. 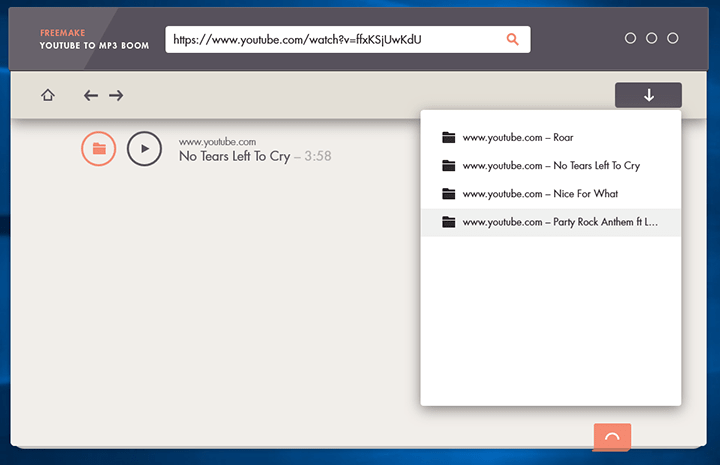 The best part about it is that there is no necessity to open your web browser and copy the YouTube link, because you may simply type the name of the artist or song in the program’s search bar and all possible results are revealed in the main window. Additionally, you can use popular hashtags (#top100, #rock, #pop, etc.). By default, Freemake YouTube to MP3 Boom saves the output audio file in MP3 format, so it lacks the possibility to choose an output audio format. 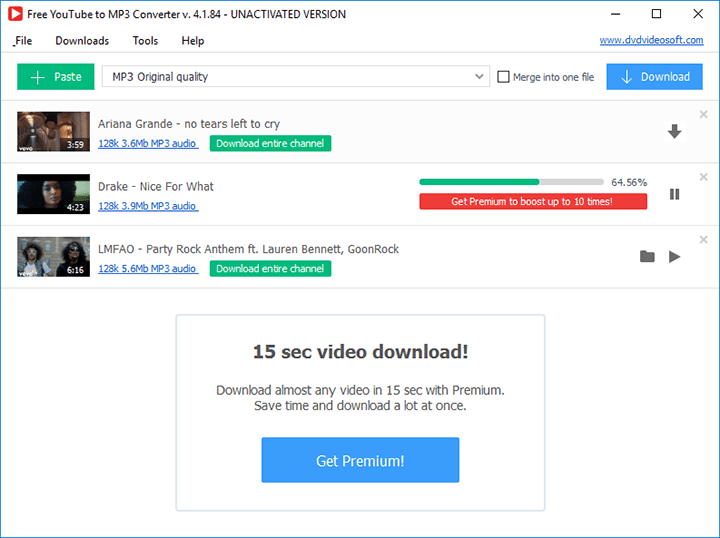 Another great tool for a quick download video and audio from YouTube, Free Video Downloader for YouTube lets you save video as MP4 and WEBM, and audio as MP3 and M4A. The program enables you to download both video and MP3 audio files at the same time, in this way you can choose to save only video or save video and MP3 audio files together. Free Video Downloader for YouTube comes with no ads or unwanted extra applications – just a clear, simple and well-designed tool that will rip the music you want with the minimum of hassle. It features the ability to queue up three links for downloading. The beauty of Free Video Downloader for YouTube is that there’s nothing superfluous and confusing as it focuses on a single task, and does it really well. 4K Video Downloader is a powerful, highly customizable and simple to use piece of software that can be also used for extracting MP3 audio from YouTube. For basic YouTube audio downloading, simply paste any YouTube URL, opt to just keep the audio, choose an output format, quality, location and click the ‘Extract’ button. There’s a great choice of formats – both video and audio – including MP4, MKV, 3GP, MP3, M4A, and OGG. 4K Video Downloader can also convert entire playlists up to 24 videos long. To unlock the ability to convert more, you will need to activate a License key which will cost €12 for a lifetime license for three PCs. In addition, 4K Video Downloader supports downloading from many sites besides YouTube, including Vimeo and DailyMotion. aTube Catcher is another amazing versatile toolkit which lets you download audio from YouTube in a format of your choice: MP3, FLAC, OGG, WMA or WAV. There are three preset resolutions for MP3 format, so you can choose the right balance of file size and fidelity. In matter of output settings, it is possible to change the default saving location, set the number of active downloads, enable turbo mode, as well as to power off the computer on task completion. But unfortunately, there is a bundled adware to avoid. So be watchful during the installation and uncheck any additional bits and pieces you don’t want. aTube Catcher provides its diversified features at the disposal of both beginners and experts, and the option to save YouTube audio is only one part of what it can do. However, aTube Catcher is definitely among the best available free YouTube to MP3 converters. If you think we’re missing a program that should have made it on the list, please do not hesitate to Contact us.